Dr. Klein is a 2005 graduate of Northwestern Health Sciences University. He also holds a bachelor’s degree in Exercise and Sport Science from Iowa State University. He is passionate about chiropractic and bringing chiropractic care to everyone in the area. Dr. Klein has a great deal of interest in working with athletes in both injury recovery and injury prevention strategies. He has a passion for helping people make proactive lifestyle changes including strategies for weight loss and physical conditioning through exercise and strength training. Dr. Klein’s other interests include spending time with his beautiful wife Sara and his children Johann, Liam, and Anya. In hiis free time you can find Dr. Klein lifting weights, running, or working in his garden. If you are suffering from neck, back, or neurological problems, due to injuries or chronic conditions, Dr. Klein is the chiropractor for you! 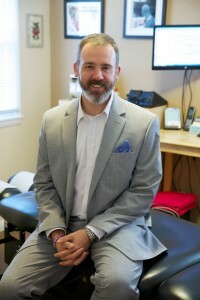 In addition to traditional Chiropractic care he utilizes low level laser therapy with an Apollo Laser, kinesio taping techniques, and therapeutic modalities.